The fictional World War Two story of an Allied commando mission to blow up two massive and entrenched German canons on the Greek island of Navarone, Alistair MacLean's novel receives a rich, expansive screen treatment, more than two and half hours of engrossing film-making, mixing equal measures human drama with sometimes harrowing, always tense action. A flotilla of Allied ships needs to rescue 2,000 stranded men from the island of Keros. The German guns will decimate the naval rescue mission unless they are first knocked out by Captain Mallory (Gregory Peck), a rock climbing expert, leading a team that includes explosives ace Corporal Miller (David Niven) and Greek Army Colonel Stavros (Anthony Quinn). 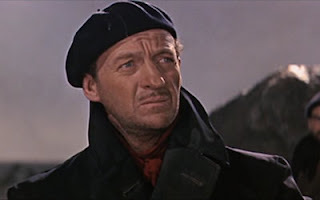 The commandos have to land unnoticed on Navarone; scale vertical cliffs; infiltrate the island with the help of the Greek resistance; survive the treachery of a traitor; gain access to the fortress above the gun emplacement; and find a way to destroy the guns; all in a limited time-frame and despite the presence of German troops throughout the island. With the never ending challenges of the mission more than capable of overwhelming any exploration of men at war, The Guns Of Navarone succeeds because the central characters are equally as strong as the surrounding events. What could otherwise have been a routine war movie is dramatically enhanced with a rounding out of the tension in two relationships: The mission-focused Captain Mallory clashes with the war-weary Corporal Miller; and Mallory also has an unfortunate and lingering history with the family of Colonel Stavros. All three men emerge from behind the uniforms as human beings, and producer Carl Foreman's script gives each enough screen time to become a person rather than a role. 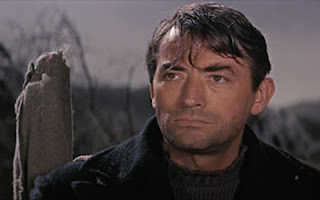 Gregory Peck, David Niven and Anthony Quinn grab the opportunity to shine, and are helped by a more than capable supporting cast including Stanley Baker, Anthony Quayle and Irene Papas, with Richard Harris in a small role. The Guns Of Navarone is one of the brightest moments in director J. Lee Thompson's otherwise checkered career. He allows the action to breathe and the characters to develop, with long stretches of the movie proceeding without dialogue, demonstrating confidence in the unfolding story and the strong cast to drive the narrative. The Guns Of Navarone is old-fashioned war film-making at its best, entertaining, thoughtful, respectful, and classy.